Ukraine is preparing to choose a new president, with the first round of voting in scheduled for Sunday. The leading two candidates then will then face a run off two weeks later. The winner faces daunting challenges in a country struggling to tackle corruption and kick-start a sluggish economy, and still at war with Russian-backed rebels in the east. Although there are 39 candidates on the ballot, the election appears to be a three-way race between the incumbent Petro Poroshenko, the well-known politician Yulia Tymoshenko, and television comedian Volodymyr Zelenskiy, who was leading the polls with a week to go. 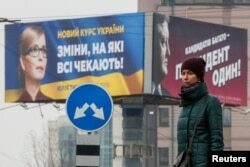 A woman stands in front of pre-election posters of opposition politician Yulia Tymoshenko and Ukrainian President Petro Poroshenko in Kyiv, Ukraine, Feb. 20, 2019. Incumbent Petro Poroshenko says he has spearheaded reforms during his five-year term, moving Ukraine toward the West and tackling corruption. His supporters say now is not the time to change leaders. "Changes in a nation come about through changes in people themselves and their relationships. This process is always slow.If you act radically, you disrupt it.I believe that this kind of radicalism delivers worse results than a gradual evolution," says prominent Poroshenko supporter Alexander Paskhaver of the Kyiv-based Center for Economic Development. But Poroshenko's campaign been tarnished by allegations of corruption in military procurement, denting his hopes of re-election. Leading the polls is a new face in politics: 41-year-old television comedian Volodymyr Zelenskiy.During a recent visit to his campaign headquarters, banks of young supporters fed a 24/7 social media stream, promoting the Zelenskiy brand under the diminutive "Ze!'" Campaign spokesperson Dmytro Razumkov says Ukrainians are longing for new leaders. "The fatigue and the lack of trust in all the political elites has led to a decision by the Ukrainian people to punish them, and the name of this punishment is Zelenskiy." FILE - Ukrainian comedian Volodymyr Zelenskiy, who played the nation's president in a popular TV series, and is running for president in next month's election, is photographed on the set of a movie, in Kyiv, Ukraine, Feb. 6, 2019. In Zelenskiy's television comedy show, titled Servant of the People, an everyday Ukrainian worker becomes president by chance.So is life about to imitate art? Some say it's just too good to be true. The billionaire owner of the "1+1" channel that broadcasts the show, Ihor Kolomoisky, is accused of fraud at Ukraine's Privat Bank, leading to claims that Zelenskiy is an oligarch's puppet.His team strongly rejects that accusation and says Zelenskiy would take on Ukraine's corrupt elite. "The first task is to remove the immunity from prosecution of everyone MPs, judges and the president." The third leading candidate is Yulia Tymoshenko, instantly recognizable as one of the faces of the 2004 Orange Revolution in Ukraine. Since then she has been twice jailed on disputed corruption charges and has now returned to the political front line, promising cheap gas prices and a trebling of state pensions. That has put her on a collision course with the International Monetary Fund, which has loaned Ukraine billions of dollars. "Her supporters see her as a miracle worker.Her voters are the poorest people of Ukraine: pensioners and people with low salaries," says Volodymyr Fesenko, an analyst at the Center for Political Studies in Kyiv. He adds that looming over the election is the ongoing war in the east and the constant threat from Russia. "No matter who becomes president, they can't finish this war by themselves.But they also can't meet (Russian President Vladimir) Putin's conditions, as the people of this country won't accept it, so it is a stalemate." From the 39 candidates vying to be president, the ultimate choice will likely come down to a familiar political player who knows the system or a fresh face untested on the political stage.With the country at war, that it is a tough decision. Many Ukrainians say they remain undecided over who should be their next leader.